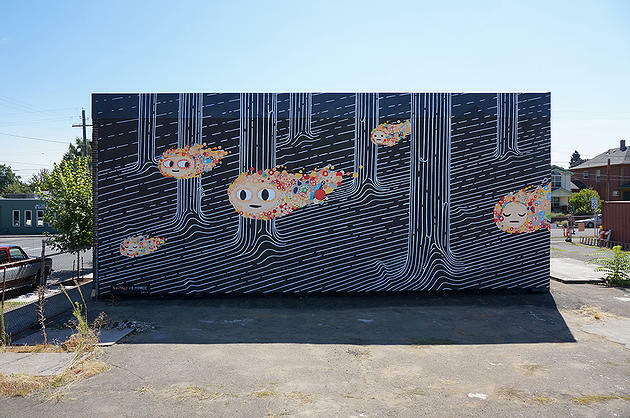 You gotta love Portland, OR and how they are always trying to make their city look a little bit more exciting by allowing artists to come and paint large murals around the city. Recentely they have justy finished a project called Forest for the Trees that is a not-for-profit public mural project where they get together 20 different artists from around the country and do 15 murals in the city. The best thing about this project is that it is fully open to the public to come by and enjoy watching the artists while they are in their mode painting the murals. They even held a bike ride that you could follow along with that went all around the city where the artists were going to be painting. This is an excellent form of art and a way to show visulazation and expression and a great way to improve the communtiy by bringing in a little bit of color and style. More citys should get together and host not for profit art projects like this. Maybe Portland being weird is really not such a bad thing after all. Think about it.